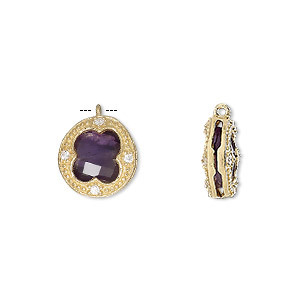 Drop, cubic zirconia and 14Kt gold-filled, purple, 6.5mm faceted round. Sold individually. 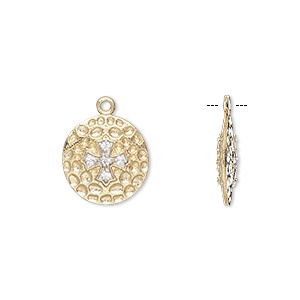 Sparkling drops made with gold-filled bezels and cubic zirconia. The soldered ring ensures a secure hold to your designs as the spectacular faceted gems add sophisticated style. 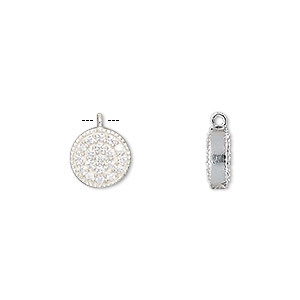 The cubic zirconia have a multi-faceted cut and a pointed back. Due to the rough cubic zirconia material, color tones may vary. Drop, sterling silver and cubic zirconia, clear, 6.5mm round with 6mm faceted round. Sold individually. Drop, cubic zirconia and antique gold-finished bronze, clear, 14mm single-sided round wheel with 2mm faceted round. Sold individually. 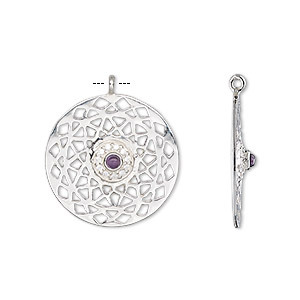 Drop, amethyst (natural) / cubic zirconia / sterling silver, clear, 19.5mm single-sided flat round with cutout design. Sold individually. 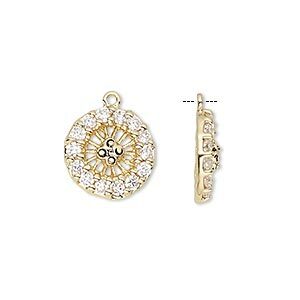 Drop, cubic zirconia and gold-finished sterling silver, clear, 13mm double-sided textured flat round with cross. Sold individually. Drop, sterling silver and cubic zirconia, clear, 3mm faceted round. Sold per pkg of 14. Drop, cubic zirconia and antique silver-plated bronze, clear, 14mm single-sided round wheel and 2mm faceted round. Sold individually. 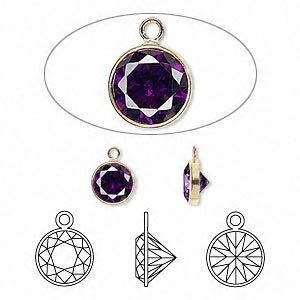 Drop, amethyst (natural) / cubic zirconia / gold-finished sterling silver, clear, 12mm two-sided faceted round. Sold individually. Drop, black onyx (dyed) / cubic zirconia / sterling silver, clear, 19.5mm single-sided flat round with cutout design. Sold individually. 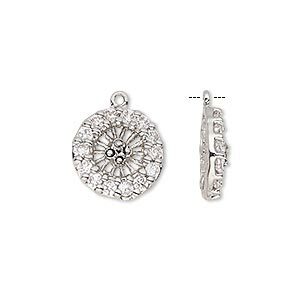 Drop, cubic zirconia and sterling silver, clear, 13mm double-sided textured flat round with cross. Sold individually. Drop, cubic zirconia and sterling silver, clear, 6.5mm double-sided flat round. Sold individually.